Microsoft has officially launched Canvas Blaze MT500 smartphone in India. Micromax has parterned with MTS to launch this smartphone and also this is made exclusively for MTS. This is the first Micromax smartphone with Dual Sim ( CDMA+GSM ) dual connectivity support. It comes with a 5-inch TFT display with 854x480 pixels resolution. It runs on Android 4.1.2 Jelly Bean operating system and powered by 1 GHz dual core Snapdragon Processor. Micromax Canvas Blaze features 8 MP auto focus rear camera with LED Flash and also 0.3 MP front-facing VGA camera. It has 768 MB of RAM, 4 GB of internal memory and the expandable memory up to 32 GB with microSD cards. The phone packed with 1850 mAh battery that provides 5 hours of talk time and it has the connectivity options are 3G, Wi-Fi, Bluetooth 2.0 and AGPS. 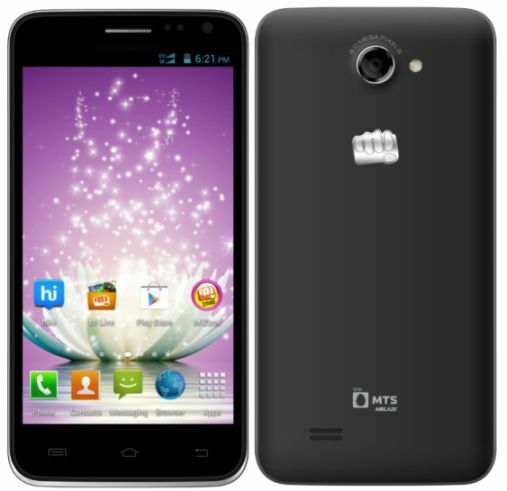 Micromax Canvas Blaze comes in Black and White colors and it is officially priced at Rs.10999. The phone also comes with special offer of 2GB internet, 2 hours Local/STD calling, 100 local MTS-To-MTS free minutes per month valid for 6 months.